Last Supper of the Lord & Foot Washing 6:00 p.m. Seven Last Words 12:00—3:00 p.m. 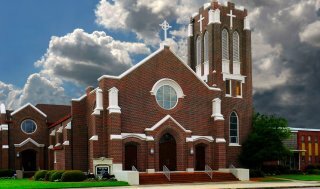 Passion of the Lord, Adoration & Communion 3:30 p.m.
Catholic Schoolhouse of Hattiesburg will be hosting an Open House on Thursday, March 28 from 9:00-12:15. Catholic Schoolhouse is designed to help homeschool families enrich their learning experience by a classical approach to education in a Catholic environment. Please contact Anne Kathryn DeViney for more details at 601-606-5685.